A true local product who has found success on and off the field, Gabe Kapler achieved his greatest athletic glory in 2004 as a member of the World Champion Boston Red Sox. Born July 31, 1975, Kapler starred at Taft High School in Woodland Hills before making his collegiate mark at Moorpark College. He made his professional debut on September 20, 1988 and spent the past seven seasons playing for the Red Sox, Detroit Tigers and Texas Rangers, as well as the Yomiuri Giants in Japan. In his 778-game professional career, Kapler has amassed a lifetime .271 batting average with 62 homers, 290 runs batted in and 67 steals over nearly 2,300 at-bats. 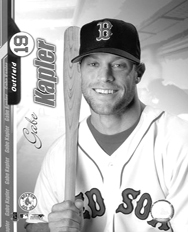 As a member of the World Champion Red Sox of 2004, Kapler batted .272 with six homers and 33 rbis in 136 games. A clubhouse favorite among players and media, Kapler was the recipient of the 2000 Harold McKinney Good Guy Award from the Dallas-Fort Worth BBWAA. He is equally adored by fans, and has reciprocated by purchasing and distributing 50 tickets to each Sunday home game to youth groups while he played for the Tigers and Rangers. Gabe and his wife, Lisa, have two sons, Chase Ty and Dane Rio.